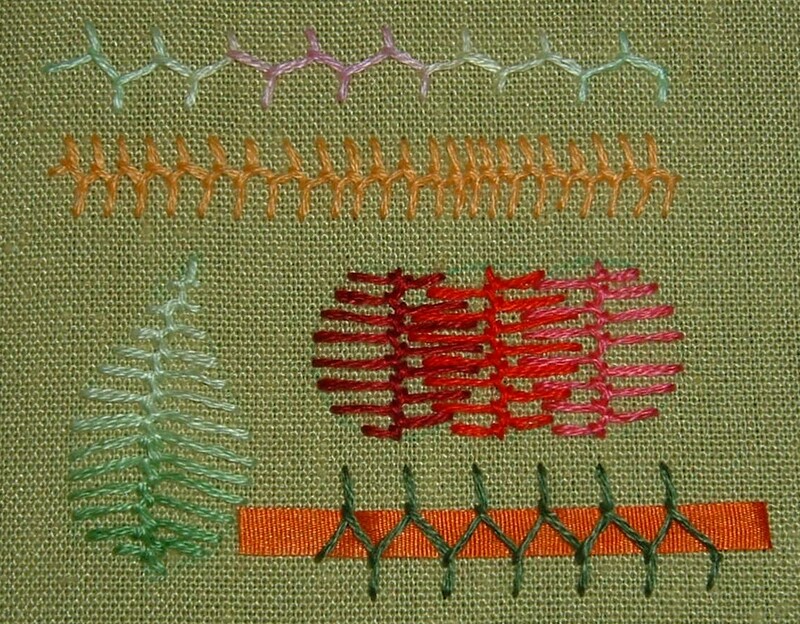 Take a Stitch Tuesday is already in its fourth week, and this week’s challenge was Cretan Stitch. While I’m pretty sure I’ve used it before, this is a stitch I’m not that familiar with. I also didn’t have that many ideas of what to do with it, but was ready to give it a try nevertheless, since trying is the whole point of this challenge. As I did during the previous weeks, I started with the basic open and closed versions of the stitch. As you can see, the closed version would have worked much better with a wider stitch, with my narrow line I struggled to get the stitches close enough together. I next drew a simple leaf form on the fabric and filled it with Cretan stitch. I like the effect of getting a rib in the middle at the same time as filling the leaf in. Next I tried to use the closed form of the stitch to create overlapping forms. While those circles are far from perfect, I think the idea has potential. And lastly I used the open stitch to couch down a bit of silk ribbon. Thanks everybody for your kind comments. I’m having fun with this project!